On September 4, 2011, our club was honored to host the “Concert of Life” with SEAPC Touching Hearts at the Mt. Tamalpais United Methodist Church in Mill Valley. This concert was dedicated to the Tibetan children who need heart surgeries. Our crew members from San Domenico School, Peggy Cui, Kimberly Lin, Angela Lo, Rita Chen, Joanna Lu, Rita Hu and Nichole Chen, arrived at the church at 5:00 pm. They set up the reception, performance platform, and a mini snack bar. Then, Matt Geppert from SEAPC arrived with information about the children SEAPC Touching Hearts has treated in Tibet. The concert started at 7:00 pm with Matt’s introduction about how their operation started in Tibet. After Matt’s speech, Peggy took over the stage and announced the concert to the audience. We had Matthew Lee start the concert by playing 2 piano pieces one by Bach and the other by Alberto Ginastera. Following him, Gaby Berbey performed Violin Concerto in E minor, 3rd Movement by Felix Mendelssohn. Then one of our guest performers, Alice Zhu, from Cupertino, performed Sonata Op.2 No.2 in A Major, 1st mvt by Beethoven. Following Alice, Kenji Bellavigna performed a clarinet piece by Mozart in great style. Then our second guest performer, Kevin Zhu, at age 11, gave a 20-minute performance with accompaniment of his sister, Alice. His first piece was the Sonata for Violin and Piano No. 3 in G minor, D 408, 2nd and 4th Movement by Schubert. His second piece was Carmen Fantasy by Pablo de Sarasate. His flawless playing of complicated violin techniques won the audience’s hearts and respect. During the intermission, people were taking photos with him and asking for his autographs. After the intermission, R. J. Pearce performed 2 piano pieces by Chopin: Mazurka Op. 6, No. 3 in E Major and Nocturne Op.9, No. 1 in B flat minor. Then I concluded the classical performance section of our program with Kreisler’s Tambourin Chinois, accompanied by R. J. Pearce. Peggy took over the stage again and introduced Rita Hu, who played a traditional Chinese instrument, calabash flute also called Hulusi. After Rita’s performance, our club’s two talented members, Tyler Leswing and Stephen Spies presented their self-composed pieces. Tyler’s piece was on the piano and he dedicated his song, Tibetan Heart, to the Tibetan children. He also jazzed up Heart and Soul with his sister, Sophia Leswing. Then a quartet piece by Stephen was performed by me, Mae Frank, Stephen Spies, and Joyce Kwon. The program ended with a touching prayer from Matt. We hope this concert brought music, talents, and culture to our community. Through our club members’ efforts, we hope to bring people’s awareness about the children in remote Tibet who desperately need heart surgeries in order to survive and live when they become teen agers. Tyler Leswing, piano, The Urban School of S. F.
On July 16th, 2011, four members from Children in Need, RJ, Gaby, Tyler, and Caitlin, performed at a beautiful home in the hills of San Rafael. This was a fund-raising event named Outreach to Children by the Marin Golden Gate Opera. We began by performing outdoors as guests arrived and spent time by the pool. RJ and Caitlin played many of the same pieces they performed at Smith Ranch Homes a few weeks ago. However, the program also included wonderful playing by Gaby and Tyler. Then, the guests moved inside to listen to a performance by opera singers, Olga Chernisheva, Russian soprano & Torlef Borsting, Hawaiian baritone, from the Marin Golden Gate Opera, giving us some time to rest and play chess. As dinner was served, we continued to perform and entertain. After dinner, the opera singers resumed their performances including selections from Carmen, La Boheme, Tosca, Don Giovanni and Figaro. All the performances received an excellent response from the audience. Many guests came to thank us for our performance. It was wonderful to see all those happy faces, and to know that not only are we bringing music and happiness to our own community, we're helping to support local children. Every year, through public and private sponsorships, GGO has been able to provide tickets for in-need families and children to attend their public performances free of charge. 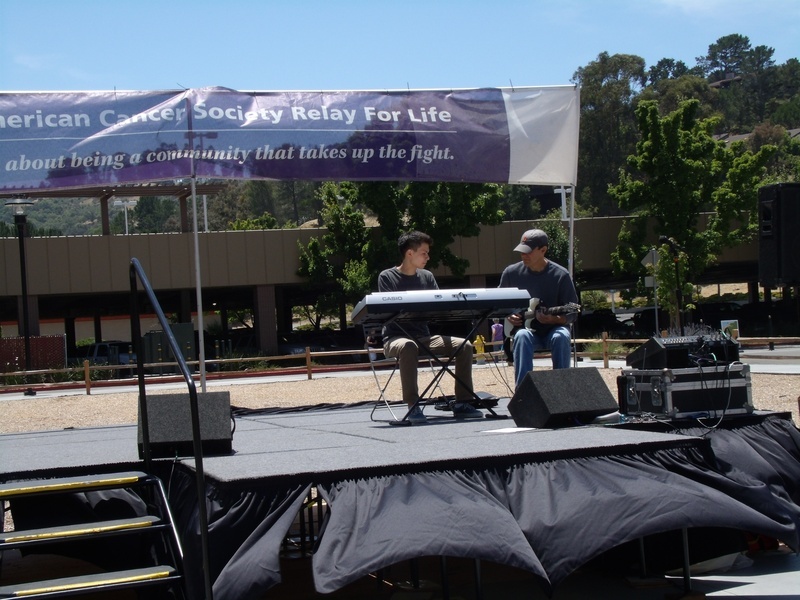 On June 18th, 2011, the American Cancer Society had its Relay for Life at the Northgate Mall. This Relay for Life is a fun-filled overnight event designed to celebrate cancer survivors and to raise money for further research. During this event, teams of people gathered at schools, fairgrounds, or parks, and take turns walking or running laps. Each team tried to keep at least one team member on the track at all times. 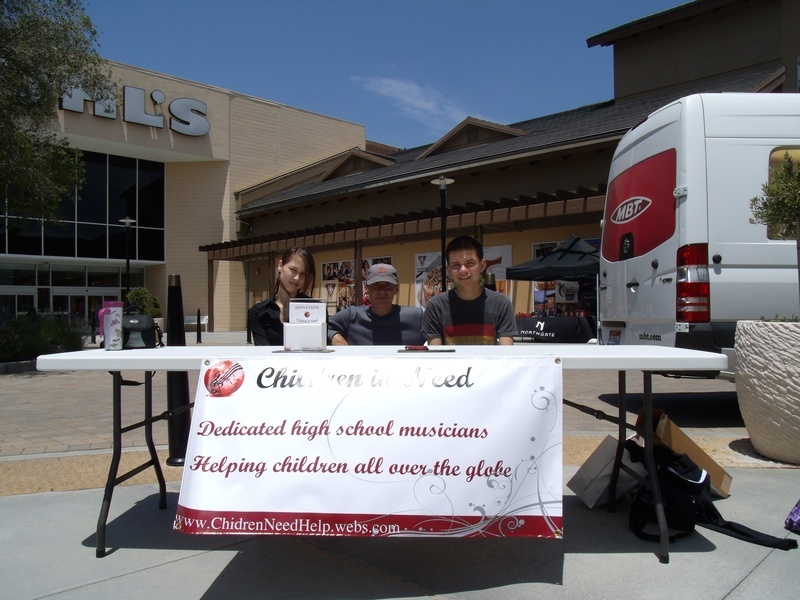 Children in Need had the honor of performing at this event. 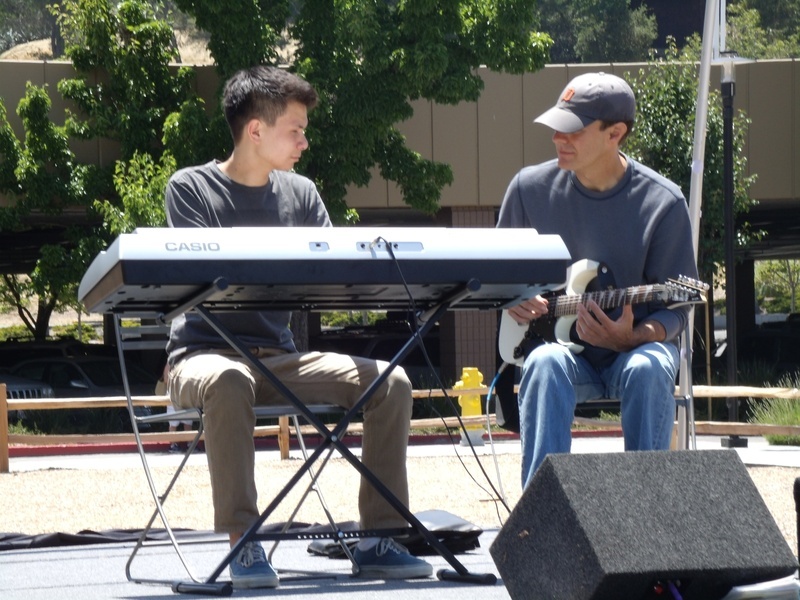 Tyler Leswing, a member from the Apassionato Group, and an honored guest, Tony Darren, performed jazz on Northgate's outdoor stage. Tyler composed these songs by himself and Tony accompanied him. Tyler has studied piano for many years and loves to compose songs. He is joining the Berkeley Jazz Camp and the Stanford Jazz Camp this summer. Children in Need is excited to have Tyler join the club with his exceptional talent and skills. We are also excited to have Tony, an accomplished electric guitarist, perform with Tyler. Tony is a skilled composer and has his own album, Sun Song. We are looking forward to performing with him again. On the night of Easter, April 24th, 2011, our club had a fund-raising concert for Japan Relief. It turned out to be a small concert because of the holiday. However, we were able to raise about $700 through the concert. By adding the totals from both the concert and the bake sale, we were able to donate $900 to the Japan Fund created by Save the Children. Before the concert, our lighting director, Rita Hu, and I gathered in the control room to deal with some technical problems while the performers practiced their pieces. During the concert, everyone performed their pieces beautifully. The Fermata Group members, including Matthew Lee, Gaby Berbey, Migimatsu, and Caitlin Gowdy, performed classical pieces by Bartok, Brahms, Chopin, and Prokofiev. We also had a guest performer, Nina Park, from san Domenico who performed two movements of Bach. Then we had an intermission for the audience to take a break to get some cookies and drinks. This song describes the feeling of losing someone you love but staying strong while drying your tears. Through this song, we hope that victims of the earthquake and tsunami can turn their sorrow into courage and move on but always remember their beloved ones. The program ended with Crystal Shan’s modern interpretation of a traditional Chinese dance. Her graceful performance with a feather was new to our club’s usual repertoire and received great compliments. We would like to thank all the performers and the crew who had made this concert memorable. We also want to thank the audience who came to support our club. Thank you everyone. On March 25, 2010, our club had the first benefit concert. Congratulations to every excellent performer! We arrived at Smith Ranch Homes around seven thirty and received a cordial welcome. People there led us directly to the performance hall. The hall was already filled with seats which had our designed program sitting on them. Everyone felt nervous. Musicians, Gaby, Caitlin, Maggie, Kim and Angela, were busy with practicing while Alison was warming up her voice. The concert started at eight. Violinists, Caitlin and Maggie played two pieces each and Gaby played one. Alison sang two songs. Flutists, Kim and Angela, played one piece each. The one-hour-concert ended with the pianist, Toki’s melody. Everyone clapped their hands and thanked us for giving such a fabulous evening. I was the Media who took the pictures and supported my teammates. I feel proud of having all talented teammates. Great job! Also, thanks Peggy, being a great announcer. Thanks Mr. Graber for his piano accompaniment. Thanks Joanna for being in charge of the music stands during the whole performance. And, thanks for everyone who attended the concert, and all people who pay close attention to our club. We are planning for our next concert. We raised $400 from this concert and it was for the earthquake victims in Haiti.